“The Cloud” is all the rage nowadays and for good reason. It gives you more storage space, faster storage, and distributed access. It’s essentially an automatic backup and can take away a lot of the headaches that come with moving and testing a website. While there are some disadvantages, like less access and security worries, these would either exist on your own server as well, or are more than worth it for most. In this post I’ll show you how I offload all of my media onto Amazon S3 using WordPress and some plugins. I’ll also show you how you can use Amazon CloudFront to serve your files via a CDN for faster loading times and latency across the board. My main reason is that detached media makes my life easier. Imagine you want to migrate a website to another server. If this becomes necessary, chances are it is because your website outgrew its current lodgings – you probably have more than a few images. Everything inside WordPress, like posts, themes and plugins, takes up very little space. Even a sizable blog may only have a database of about 2-3MB. Perhaps your themes and plugins take up 10-30MB, but most of those don’t have to be moved, they can be re-downloaded. Whenever you upload an image to WordPress, at least three other versions of it get created (unless its dimensions are very small). This means that for each image you upload, there are actually four images on the server. So if you’ve uploaded only 100 images, this would amount to 400 images and could easily exceed 400-600MB. Using fancy developer tools, you could easily transfer everything in your WordPress installation in a couple of minutes, and you would then spend hours on media. Not to mention upload/download timeout issues and other nuisances. If you use a cloud-based storage service all your media is served from the cloud. If you don’t want to you don’t even have to think about the uploads folder anymore. In this sense, migrating even a very large site could take minutes. Another related benefit is testing. If your developer uses a local environment to test, images will work just fine as they will be pulled from Amazon servers, as opposed to WordPress looking on a local hard drive. Amazon is huge. You will not be able to create a site which their servers can’t keep up with. Say you have a site with 1,000 videos and hundreds of users viewing them at once. Seems like a lot, and it is. Amazon is so big it hosts for Netflix, which is one of the biggest streaming media provides, and is just one of Amazon’s customer. The peace of mind you get knowing that your hosting needs are scalable can’t be understated. With great size comes great pricing. Amazon really is very cheap, which they can afford because of the huge amount of data they handle. The pricing is a bit complex because they charge for storage, requests and transfer separately, but it’s all very cheap. Take a look at their pricing page. Some people argue that a big drawback of using such a huge system is that if something goes wrong you can’t really do anything about it. I for one feel a lot safer using Amazon; I would bet on my server crashing before theirs. Unless you have multiple redundancies and a dedicated server team, chances are your current servers are way less dependable than Amazon’s. That being said, I actually do store my media locally and I also back it up as a precaution. You’ll need a couple of things to get started. The Amazon S3 And Cloudfront plugin. Once you have an S3 account you’ll have access to your Management Console, which lists all available Amazon Services. You’ll need to click on S3 to get to the S3 management area. The Amazon S3 management area. The interface above is very much like a file system. Buckets are top-level directories, which can contain any number of files and directories within them. One restriction is that bucket names must be unique across Amazon, so you probably won’t be able to use very generic names. At the top of the navigation bar click your account name and then click on the security credentials menu item. This will take you to the Identity Access Management page, or IAM, where we’ll proceed with creating a user. This user will be responsible for interacting with Amazon on your website’s behalf. Our list of users in our Amazon Console. Click on “Users” in the left sidebar and then click on the blue “Create New Users” button. You can create multiple users at once. For now let’s create a single user: “amazontestuser.” Make sure the “Generate an access key for each user” box is ticked before clicking the blue “Create” button. On the next screen you should be able to view access credentials. Access credentials for an Amazon user (not actual credentials). Make note of these values or download them as Amazon will not show them to you ever again. 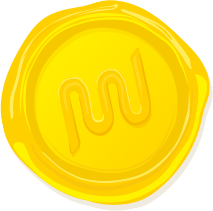 If you lose your credentials you will have to create a new user. Make sure to install and activate the two plugins I mentioned above – Amazon Web Services and Amazon S3 and Cloudfront. Once done you should see an AWS menu entry in the WordPress admin. Clicking on it will allow you to enter your security credentials. To quickly test the plugins, you need to copy in the access key ID and Secret Access Key we created earlier. Then you need to move keys to your wp-config.php file to be safe. We’ll take a look at that later, for now just plop the values in the file. Click on the “S3 And CloudFront item” within the AWS menu and let’s set things up. You’ll be able to select a bucket from your account using the dropdown. All your uploads will be placed in this bucket. I recommend setting a far future header. Make sure to check the first two checkboxes in the second set to copy to S3 as you upload and point the URLs there as well. Settings for my personal website in the S3 plugin. At this stage we could wrap up. We’ve set up a bucket on an S3 server to store your files in and we’ve made sure that URLs point there, too. If you try uploading a file, you should see the URL pointing to Amazon instead of your own domain. Image served from Amazon. Take a look at the URL. Regretfully, your already existing images will not be sent to the S3 servers automatically. The plugin creators are working on a pro version, which will do this though. A CDN is great because it serves images from a location geographically closer to the reader. If your server is in the US, a reader from Europe will experience higher loading times than readers in the US. CDNs tackle this issue by mirroring content to multiple locations and serving files from a location closer to your readers. Click on the “Create Distribution” button and then on the first “Get Started” button under the “Web” section. There are quite a few settings here but all we need to do is select our bucket in the first “Origin Domain Name” setting. 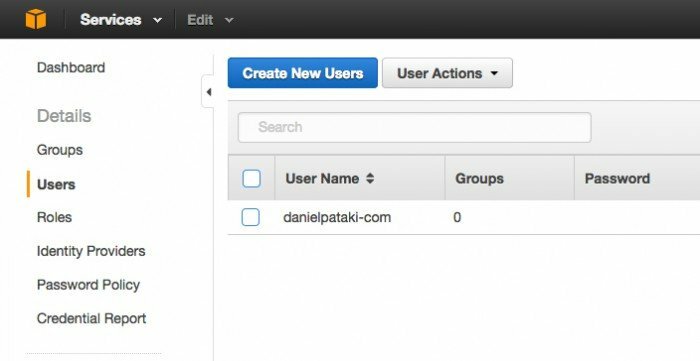 Back in the Amazon S3 With Cloudfront plugin, go back to the settings and under the “CloudFront” settings fill out the domain name field. This should be the value of the domain name column in the CloudFront List. I think Amazon S3 is a powerful and simple solution to a problem. By using it to store my media the burden of keeping it safe is off my back, especially since I usually couple it with VaultPress for greater security. I can move sites whenever I want and scale my applications naturally without fear of breakage. In addition, using CloudFront lowers loading times for everyone involved, which can contribute directly to the money making potential of a project. Do you use Amazon S3? What are you experiences with hosting media in the cloud? Let us know in the comments below. This might work for new websites. I use cloudfront as my CDN, and save backups offsite to S3 buckets. Any idea how to retrofit a longtime site and migrate the data to an S3 bucket? Hopefully the people behind the plugin in the article will bring this functionality soon! It’s a bit difficult to put this functionality into a plugin because it requires the plugin to upload your media in the background. I would definitely start by simply copy-pasting my wp-content/uploads folder into a bucket. You can then take a look at how the S3 plugin stores references to the file, it’s somewhere in the postmeta. You can then create that reference for each media item. I might take a look at it later. oops — misread your response. Not a change but adding something, it seems. Thanks. How does this affect page load time? I would think the extra request could slow things down. I’m not sure this is a policy issue. When I take a look at the settings I see all my buckets, even those without policies. It may however be a user issue, Amazon did muck around in there in the past year or so. When you create a user make sure to assign them a policy. The descriptions of these is pretty easy to follow (http://cl.ly/image/2i1k1B2B433u). I use “CloudFront Full Access” I think on my users. Thanks Daniel, that worked a charm. if we go with S3 for storage and Cloudfront for CDN do we sort of get double billed, once by S3 and then by Cloudfront? or am I missing how this works.. I also don’t want to ‘copy’ my Media Upload File, I want it to reside on the cloud storage someplace. WP2Cloud touts doing that, but the installation of CloudSE on the MySQL server is sort of a pain. Well, you do pay for each separately but they perform different services. So it’s not double billing :) S3 is basically a storage space but also a place to serve some content from.Coudfront is a way to put content in front of your users faster by utilizing a content delivery network. As for the second part I actually haven’t tried it yet but I think it uses Amazon EC2 as the server so this would require more setup. I have doubts about the usefulness of this. It may be faster than using a shared hosting service but I think that if you use a proper VPS or dedicated server this is not an issue (unless you need crazy large scalability). Cloudinary has been performing very well but not all plugins make it available when doing edits etc. I’m running several multisite networks with websites and directories with mixed users with varying skillsets and I’m certain i need to get the Uploads folder off my server – but issues come up with standard setups doing Pull CDN which leaves the originals on the server. Then there is an issue of needing the Uploads to maintain year and month folders – which means the cloud storage used as the Media Library Uploads needs to be able to add folders dynamically (Cloudinary doesn’t do that yet). My VPS has good performance but space is limited and I’m not really prepared to parse my backups, so they’re getting fat… and because of the users I need frequent backups. I will give a shoutout to Sedlex Backup Scheduler that allows for backing up multisite subsites separately from mainsite (not trivial issue so that users can do their own backups). I’m looking to put the backups on the cloud too. First of all, I would create an S3 bucket and manually copy-paste my uploads folder into it. This will take a while, but only needs to be done once. I would use the Amazon S3 With Cloudfront plugin to make sure all new images are copied to and served from S3. Once this is done, I would make sure all existing images are served from there. You’ll need to add a specific meta field to all images. I’m not sure what the field is but it shouldn’t be too difficult. Finally, I would set up Amazon Cloudfront to make sure they are served from a CDN. This should take care of the media serving needs. As for backups I would just use VaultPress. You will need an account per site so this can be costly but if you have the cash it will give you peace of mind. If you don’t have the funds then just backing up the database should be well enough since all your files are backed up on S3 and your own server. if I have media on amazon with amazon url’s, does that not affect SEO? I try this on a dummy site (for not screwing my current website) and works perfectly . Now I do the same on my main site and doesn’t work! :( I do everything well but the plugin doesn’t list my current buckets. I manually put the bucket’s name but doesn’t save anything. I granted access to the user to S3 service I really don’t know what I’m doing wrong. >> Regretfully, your already existing images will not be sent to the S3 servers automatically. The plugin creators are working on a pro version, which will do this though. This will run the actions and hooks as if you had just uploaded the image from scratch, thereby initializing each image on S3. I will purchase the Pro version when the developers release it, but this is a stop-gap solution. Hi,Good post..Quick question..What about the bandwidth when stored on as3? Do we have to pay also? I have set up several highly available WordPress websites using Amazon and I am sold on it. I used to run a 24/7 datacenter for a previous company and would be spending thousands monthly for similar capabilities not to mention the upfront hardware cost. 1. WordPress is served from multiple web servers that scale based on load using Amazons Elastic Load Balancers and all web servers point to one central S3 bucket for their wp-content and wp-includes folders. 2. Static files are automatically uploaded from each web server to the central S3 bucket for storage and for for serving to Cloudfront using W3 Total Cache. 3. 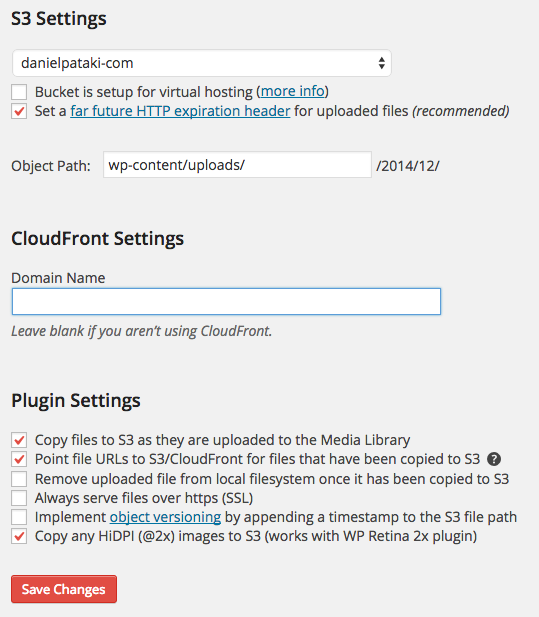 The static content is served from Cloudfront which pulls from the S3 bucket. 4. Route53 handles DNS and hand off to the Elastic Load Balancers. 5. Amazon Relational Database Service (RDS) handles the database redundantly, takes snapshots and backs up the data. 6. Identity and Security is handled by Identity and Access Management (IAM). The only issue I ran into so far was when using Buddypress for social sites. When a user uploads a profile image and if you are using W3 Total Cache the image is broken until the files are synced with the CDN because the URL for the image points to the CDN but the new image file is not there yet. So I created a plugin to grab the image after the user uploads and crops it and sync it the CDN folder for that user. Can you please share the plugin you created for this functionality ? I would definitely great help for me. Thanks in advance. My site is hosted on Hostgator, and I’ve been having some problems recently with the shared hosting thing because our media files are making our site too big. Do you recommend in this case checking ON for the “Remove Files from Server” option? Well, I would recommend getting off shared hosting :) Vultr has a $5/month VPS option (http://winningwp.com/ref/vultr/) although I would recommend investing at least $20 or so and getting one for someone like A Small Orange (https://asmallorange.com) or Siteground (https://www.siteground.com/). I personally keep the files on the server as well. The reason is that if I decide to move the site or the S3 plugin breaks or something else happens the media will just continue to be served properly from my own servers. If it is removed from your servers it is S3 or nothing. That’s kinda what I was thinking. However, I haven’t gotten this to work. I don’t know what I’m doing wrong, but nothing’s uploading to S3 at all. Ok this isn’t working at all. I followed every instruction on this page, including figuring out how to set the user with permissions, which made the buckets show up. I uploaded media to my library from the Admin screen and also in a bbpress forum reply. Both images still show a url of mysite/wp-content/uploads/year/month/filename. I turned off the three plugins I was using to manage media: rtMedia, rtMedia Pro, and Photo Gallery. No change. Nothing is uploading to Amazon S3. What am I doing wrong? Also, this will only affect images uploaded after you’ve set things up, your old images will not transfer to Amazon S3 on their own! I wanted to circle back and add to this. It is working now…and I’m guessing there was some kind of processing the S3 account had to do. I didn’t change anything at all, just waited a couple weeks (not that it takes that long but that’s how long it took me to get back to it) and it’s working fine now. I couldn’t use this because the aws plugin wouldn’t run due to my having cURL 7.15 and not 7.16. But I discovered that I didn’t really need to use all this plug in upload and erase business as I could simply upload an mp4 clip to an S3 bucket and then paste the link into my wordpress post and is ran with the built in wordpress media player. So I wonder what the point is of using the plug in. Can anyone tell me if the image editor still works when using this plugin? I tried the rackspace cloud file CDN because it synchronized existing images but the image editor doesn’t work for me when I used this one. Not a huge problem for my personal sites but for my clients it may be an issue. However, in attempting to edit the image through WP media library editor, either when first added to library or going back and editing existing, the editor seems to never finish, and if force close the editor the image file is either lost or corrupted. problem is that I think the process is a bit instantaneous, what they need to do is incorporate a button or something to manually add the images to S3.